When Herb and I got married in 1980 we didn’t have a computer and it would be several years before we did. Home printers were not really something everyone had and if you did it was the old dot matrix kind that were not what you would think of to do a Christmas card with. 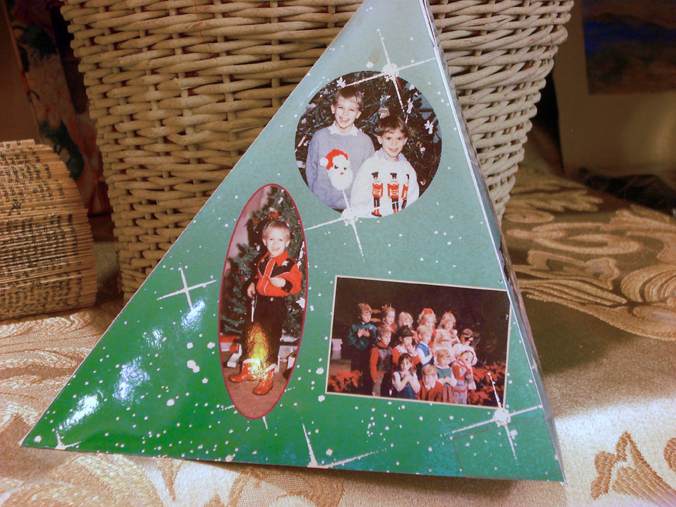 My first computer job in printing was in the day of film and laminated proofs and I was able to do our Christmas card that year as a stand up tree. 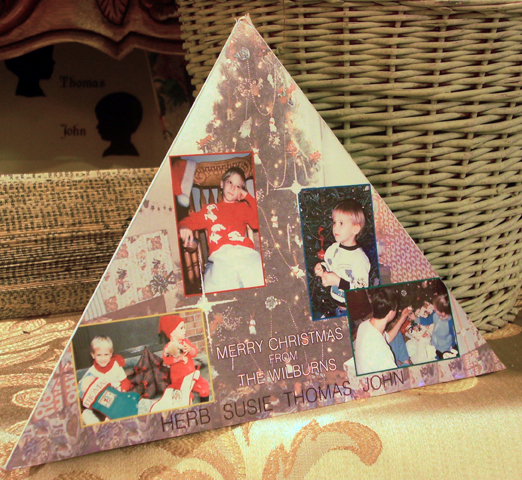 It was mailed out flat and the recipient would be expected to fold it into a triangle and tape it so that it would stand as a sort of pyramid tree. I was able to get the scanner operator at my workplace to scan the photos of my family and then I assemble the card on a Scitex computer system and then output film and sent it to a proofing department. If I remember correctly, they had some old materials they were not going to use for production and they made me about 10-15 cards. This would have taken them forever to do because each color would have to be exposed and then the next color laid/laminated on top of that one until you build up the 4 colors to create the four color image. These proofs don’t exist anymore and technology has advanced to where proofs are now viewed remotely, meaning that you send the customer a virtual proof that they now add virtual sticky notes onto to request their color corrections. Then came the digital world and my boss now refers to us as the Jetsons because we are really into the ability to produce projects on a home computer and printer. 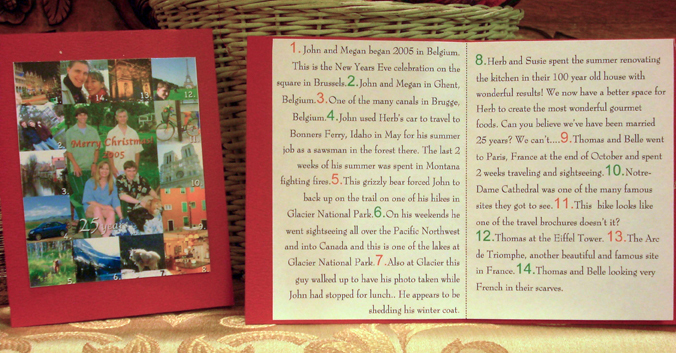 Over the years, we have sent out cards that have chronicled our previous year in photo form. Some years they take on the collage look like this one from 2002. 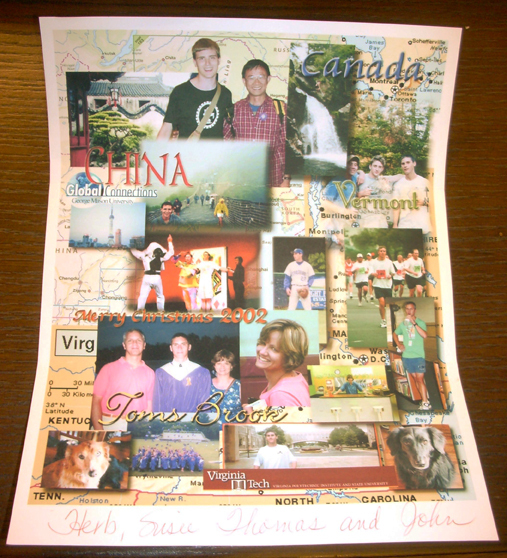 That year, Thomas had gone to China for 3 weeks with George Mason University and John had graduated high school and he and his buddies did a trip up the east coast and into Canada so the background was a map and photos of their trips placed onto the map. 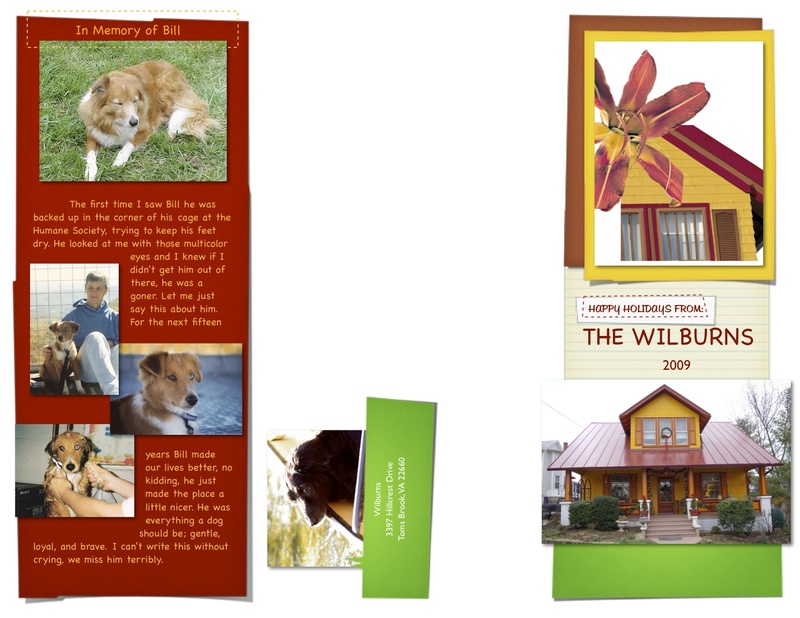 In 2005, the card was a structured collage and each thumbnail was numbered 1-14. 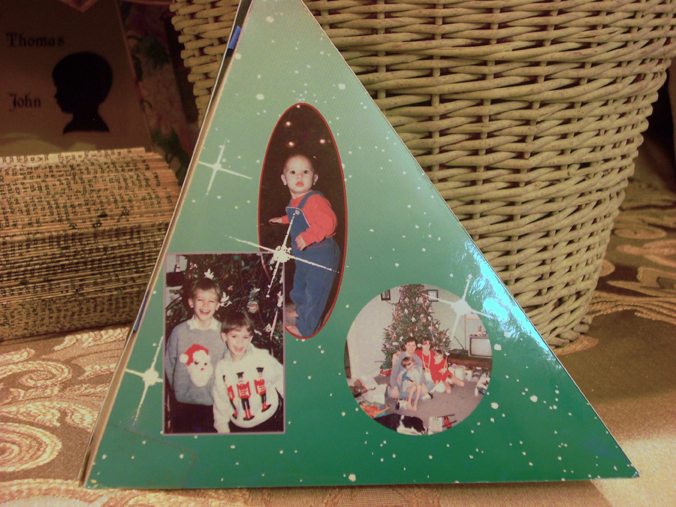 Then the inside of the card listed the numbers in red and green with a caption of that photo. That way they could look for the number and figure out what that part of our year was about. And in 2006, the family photo with John at graduation from VA Tech was the inspiration. I cropped each of our mug shots out and posterized them in the style of Andy Warhol’s Marilyn Monroe painting. 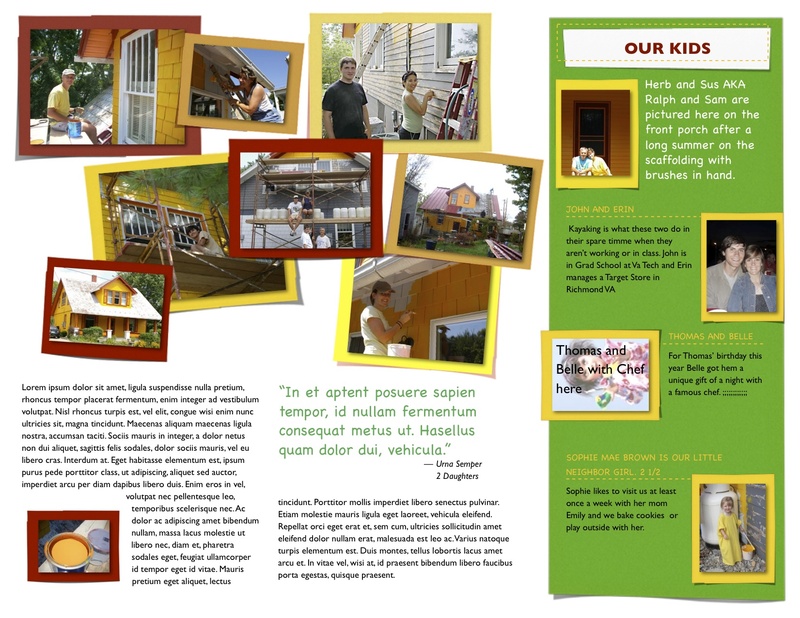 And in 2009 we had taken on the task of painting our 100+ year old house and so that year had to be the story of the house colors and the process of painting. 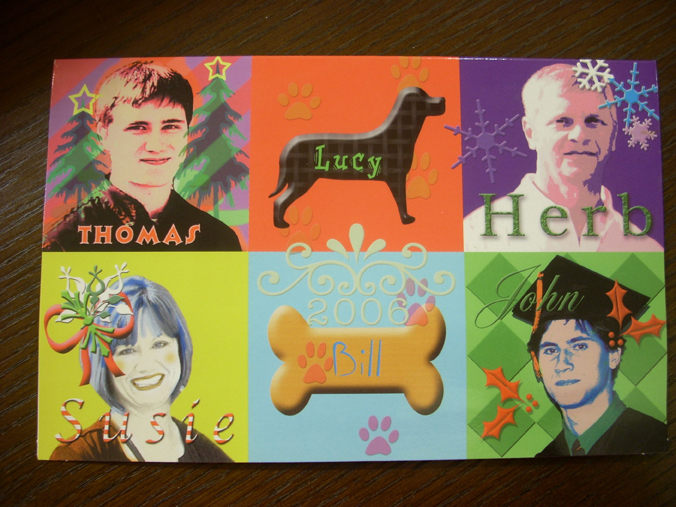 We also had to say good-bye to our sweet dog Bill of 15 years and so a panel of the card was also in memory of him. 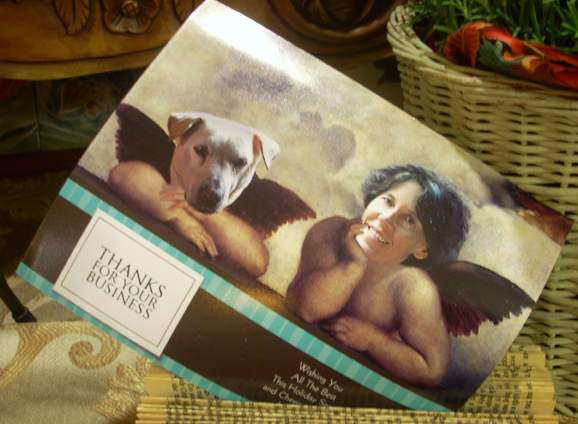 So, as Thanksgiving is fast approaching, it is time once again to think about what this year’s card will be. My friend HandyAn sends out a card to her clients that she has done work for during the year and she always comes up with clever cards too. This one she sent last year and the year before that she put herself up on a steel girder with construction workers on a skyscraper, probably in NYC. She was sitting there with her lunch bucket just like one of the guys. I went to the Netherlands in the Spring so maybe I need to find some Dutch master paintings and put us in one of those. What do you think?